BBR Saatchi&Saatchi IL, an advertising agency in Israel, is recruiting a wickedly good programmer in Diablo III, the Blizzard Entertainment game released in May 2012. 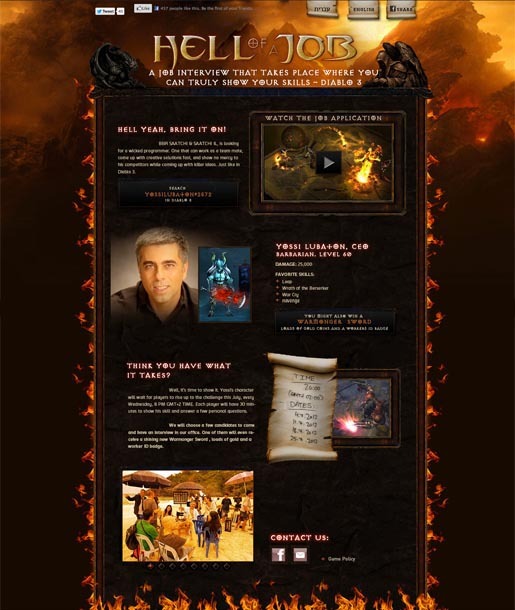 Yossi Lubaton, the agency’s CEO (and a Level 60 Barbarian), will be waiting for worthy candidates who will rise up to the challenge in the Diablo world of Sanctuary. They will play alongside Lubaton’s character in some of the toughest multiplayer missions the game has to offer. Candidates will be asked a series of personal and professional questions, and will also be judged by their game skills: fast reaction time, creative thinking and teamwork. The player who best completes the interactive interview will score the legendary Warmonger sword, one of the most hard-to-get items in the game, along with tons of gold, and will be summoned to a face-to-face interview with Lubaton in the agency’s offices. See more on the agency’s Hell of a Job microsite. BBR Saatchi & Saatchi sees the placement of a job interview inside the realms of a computer game as a great opportunity not only to make the usually stressful interviewing process more fun, but also to appeal to the target audience, and let them show their skills in a place they feel at home. The Hell of a Job project was developed at BBR Saatchi & Saatchi, Tel Aviv, by CEO Yossi Lubaton, executive creative director Nadav Pressman, creative directors Eran Nir and Eddie Goldenberg, copywriter Shachar Aylon, art director Ori Hasson, digital artist Asi Epshtain, programmer Leonid Angarov, editor Alon Shmoelof, executive producer Dorit Gvili, producers Avital Benchetrit and Alon Shmoelof, executive digital producer Maayan Tirangel, digital studio manager Danit Atia Moshe, voice artist Reuven Miller and manager Sharon Chana.